Brown Artisan Crafted Coconut Shell and Leather Necklace, "Siam Seahorse in Dark Brown"
Carved from coconut shell, a seahorse brings maritime elegance to this leather necklace by Sasithon Saisuk. She crafts the brown necklace by hand, knotting dark brown macramé at the center for a splendid contrast. 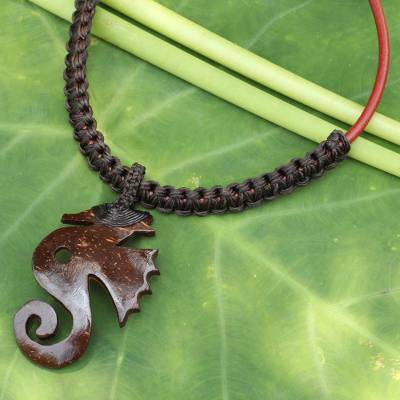 You can find leather and coconut shell flower necklace 'Siam Seahorse in Dark Brown' by Sasithon Saisuk in jewelry categories such as Animal Themed Necklaces, No Stone Necklaces, Leather Necklaces, Polyester Necklaces, Coconut Shell Necklaces and Pendant Necklaces. Enjoy exploring these sections for other Novica treasures.